Back in it's "Hey Day" it was hugely popular and yes I was a fan, but since the acquisition by L'Oreal in 2006 the brand has honestly failed to impress, other than a couple of their recently launched fragrances. The only reason that I am reviewing this skin care product is due to to being given yet another gift voucher and this Liquid Peel appealed to me for all the reasons above. 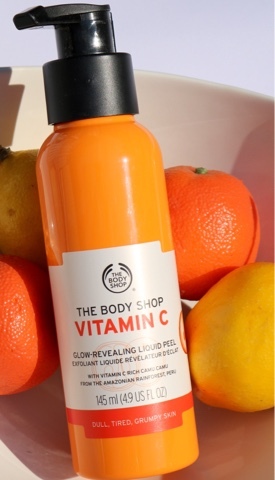 The Body Shop have a range of products based around the key ingredient of Vitamin C, which is well know for brightening and reviving a tired dull complexion. There are many other benefits of using a Vitamin C based skin care range including: collagen production, improved skin elasticity and protection against damaging environmental aggressors. so if the above benefits are ticking all your skin care need boxes then this range could be one to consider. So let's get down to the "nitty gritty" as to how this peel performed, despite having no gritty mechanical exfoliants. targets pollutants that are left sitting on the skin at the end of the day and with the pollutants in the air becoming increasingly problematic, this is another reason why an exfoliant,peel or scrub is a vital product to be included in every ones beauty regime. The transforming gel-to-peel technology traps and gently peels off impurities and dead skin cells to unveil a brighter, softer, smoother and healthier looking skin. Dispense 1-2 pumps of the clear and slightly ascorbic smelling gel onto fingertips, and apply to cleansed, dry skin avoiding the eye and mouth area. Massage into skin for up to 20 seconds until clumps become visible and peel away from the skin. Use 2-3 times per week before the rest of your skincare regime. Whilst I don't mind a liquid type peel it does require more effort and certainly creates more mess and to be fair to the product it did no more and no less than I would have expected from any other type of exfoliating product. As always, post peel, my skin felt smoother and looked brighter, however if you do use the other products from their Vitamin C range, then I advise that you include the Glow Revealing Liquid Peel in order to reinforce the cumulative action of the vitamin c.
This type of "messy" peel will not appeal to all and especially to those that have lots of fine, downy facial hair, as it gets caught in the hairs and pulls, which isn't pleasant. 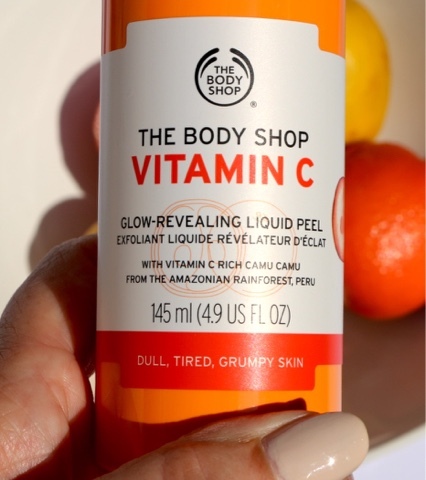 Sadly this hasn't changed my opinion of The Body Shop products and despite trying several I just cannot find anything from the skin care or make-up collections, that I can confidently say is great or a must buy for a mature skin. I feel the rinse off part is a bit tedious and I usually use a bit of cleanser afterwards to make sure I got it all off. My skin usually feels nice after I use it, not life changing, but I like it. I also enjoy the Dr Brandt microdermabrasion. I also tried it & ditched it soon after. I have very fine blonde facial hair & it got stuck on them & even after using another exfoliating product to get the little clumps off, it still took a day or 2 for my skin to be completely smooth.